DENVER — A Colorado state lawmaker arrested at Denver International Airport had a loaded handgun in her bag that was discovered by an airport security officer, police said Wednesday. State Rep. Lori Saine “knowingly brought the handgun to the checkpoint” at the airport on Tuesday, according to a report written by Denver police officer Gregory Zimmerman. The report did not explain how he made that determination. According to police, a Transportation Security Administration agent saw the Kahr Arms 9mm semi-automatic handgun when a bag belonging to Saine went through an X-ray machine, according to the arrest report. It had four rounds in its magazine but none in the chamber. Saine, a Republican who has advocated for gun rights, was arrested on suspicion of introducing a firearm into a transportation facility and spent the night in jail. 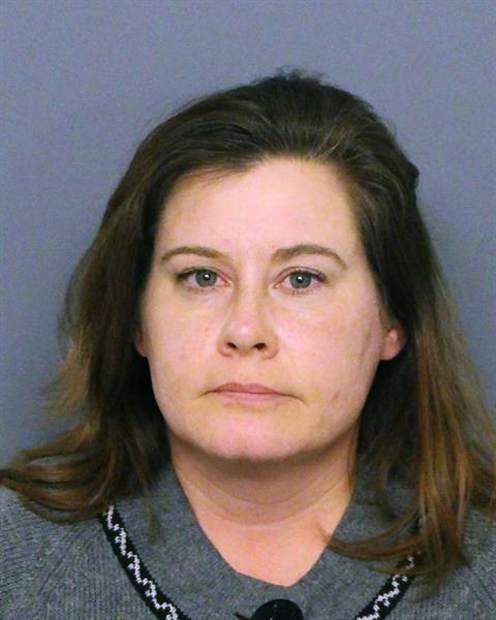 At Saine’s initial court appearance on Wednesday afternoon, Denver County Court Judge Andrea Eddy said Saine’s attorney and prosecutors agreed that she would be released in exchange for a promise to attend any future court hearings in her case. Her attorney Randy Corporon also received permission from the judge for Saine, a regional sales director for a mobile alerts company, to travel out of the state. Unlike other people who had been jailed pending their initial court hearings, Saine stood behind glass in a holding room instead of entering the courtroom. She said nothing during the hearing. No one answered the phone at Saine’s Capitol office on Wednesday afternoon, and a voicemail wasn’t immediately returned. Corporon told reporters Wednesday that Saine simply forgot that the gun was in her bag. “This was clearly an accident. She said it was an accident. She asked if she could put it in her luggage and instead was promptly arrested, put in handcuffs and marched off to a holding cell. … I don’t know why it says ‘knowingly’ in the affidavit. That’s crazy,” Corporon said. Saine was elected in 2012 and represents a largely rural, agricultural area about 25 miles north of Denver that’s seen intense oil and gas activity and growing residential development. She co-sponsored a bill in 2017 to repeal a ban on the sale, transfer and possession of large-capacity ammunition magazines. The ban was enacted after the 2012 Aurora theater and Sandy Hook Elementary School shootings. State law prohibits people from carrying guns — either concealed or openly — at transportation facilities, including the airport, said airport spokesman Heath Montgomery. He said passengers who want to travel with firearms can put unloaded weapons inside secure cases in checked luggage and must declare them to airlines. Denver’s airport ranked fifth highest for firearms discovered in carry-on bags in the United States last year, according to the Transportation Security Administration.